From what began as a humble email client known as Gmail, Google has since expanded its functionality greatly throughout the internet. Not only do we now have the worlds most popular search engine bringing us the best search results. But we now have e-mail clients, document creation, spreadsheets, video hosting, image hosting AND storage, all through the one account. And the best part about it? It’s entirely free. But what exactly is so great about Google Drive, and what made it such a success? Before Drive came about, sharing data on the internet was still in it’s infancy on a global scale. People who wished to collaborate on files mostly relied on e-mails to share information and data, as well as files. This was a fairly cumbersome method in many ways, due to the constant back and forth, which given the smaller internet plans in terms of data back in the internet’s infancy, was considered a waste of a resource. Google started with a simple program known as Google Docs, at first, to create a file that anyone could edit at the same time. Such technology was relatively unheard of before this point, so many small businesses and individuals flocked to the free service. Despite not being as elaborate as Microsoft Word, Google Docs incorporated many of it’s features. Dropbox, which was the first service that allowed multi-access file sharing, was what people tended to use for file sharing, but many people found the limited storage capacity to be rather annoying. Thus, Google developed Drive, a sharing platform that had nearly 8 times the space capacity that Dropbox offered in it’s free service. As of October 2014, Google Drive has 240 million active users, a rather impressive figure. So lets delve into the nitty gritty – why is Google Drive so popular, and how does it compare to other services around? What’s so great about Google Drive? Depending on a person or business’ needs, Google Drive can be both user-friendly and highly functional. It encompasses Youtube, Picasa, Google Maps, AdWords, Google Analytics, Gmail, Google Translate, along with many other great resources. These all come free with a single Google account, which makes it incredibly convenient. Google Drive also interacts with the browser Google Chrome – a user is able to sign in using the browser itself, which means that bookmarks and favourites are transferred through every device that that account is used on. For people with multiple computers and devices, this increases ease of use dramatically. The only downside that Google Drive has that makes it less than perfect is the data limit. A free account can only hold up to 15 gigabytes of data, which for an individual is probably enough to last a substantial amount of time. But for any business that wishes to integrate their processes with Google’s features, they ought to consider the paid packages. Google compares well to the competition in this aspect. While Dropbox is a fantastic service that offers great capacity for use, its upload limit is a mere 3 gigabytes for free. Inviting users to use Dropbox does increase this limit to a maximum of 16gig. However, this would only work if the user has a wide network of 32 other users that wish to also use Dropbox, if they don’t already have the system. Despite this, Dropbox allows any kind of file whatsoever to be uploaded to the internet. This is incredibly useful for developers, who often use file types that are foreign to the everyday user. Another great service that runs alongside Dropbox is ‘Box’. Box is more business orientated file sharing system. It comes with a variety of features. These include password locking files and user access restriction. Google Drive also matches this feature with it’s own sharing facilities, and it also gets bonus points for ease of use, which Box is definitely not. Microsoft OneDrive matches Google Drive price wise toe for toe. But it has a large amount of restrictions on the types of files that can be uploaded. 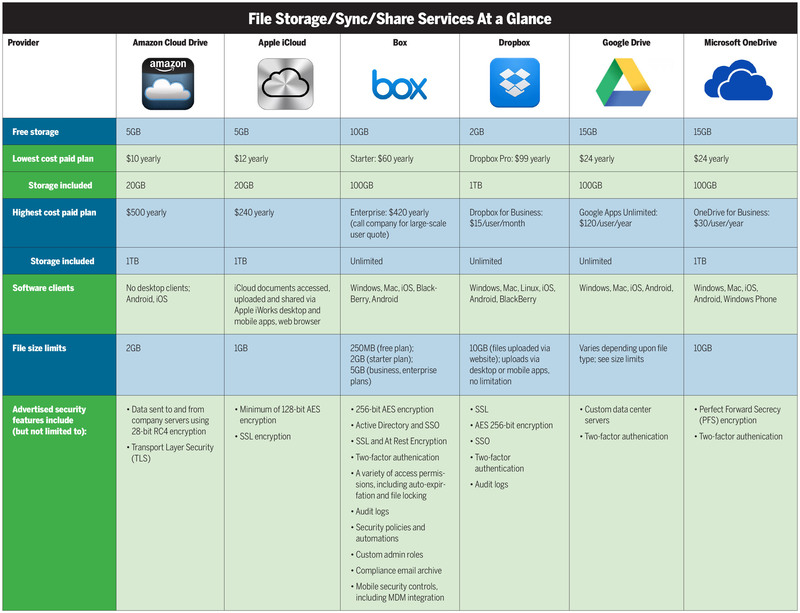 This makes it rather stiff in comparison to Google Drive and Dropbox, both of which have no restrictions on file type. Amazon Cloud Drive and Apple iCloud boast at having the lowest cost available plans. But they also have the highest cost plans available for little reward. For smaller businesses, Drive is a far better option. It also has a lot more security implementations that make it ideal for larger businesses. Overall, Drive, Dropbox and Box end up the powerhouse softwares for online uploading and services. But nothing beats the sheer range of features that Google has to offer, and for free.